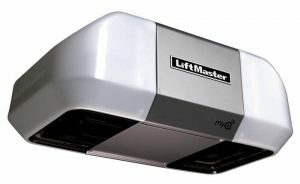 Quiet and smooth, yet as tough as a steel-belted tire, the 8355 1/2 HP Belt Drive Garage Door Opener is the perfect choice if you want both quiet and smooth-running reliability, or simply have rooms positioned above your garage. The 1/2 HP heavy-duty motor is equipped with our patented Motor Vibration Isolation System (MVIS®) that eliminates powerhead vibration for reduced noise. With MyQ® technology, you can stay connected to your home wherever you go via your smartphone, tablet or computer. MyQ enables you to manage, monitor and control everything from lights to garage door openers and beyond—anytime, and from anywhere. Our exclusive Security+ 2.0™ technology, found in the LiftMaster® garage door opener remote controls, provides extra peace of mind for you and your family. This rolling code technology assures a new code with every use, making it virtually impossible for anyone to steal your remote control signal. Designed for how you live, LiftMaster® technology puts you in control. Security with Every Click. Security+ 2.0™ rolling code technology keeps you safe ensuring a new code is sent to the garage door opener every time the remote control is used, making it virtually impossible for someone to intercept your code. Quiet Operation. The belt drive and Motor Vibration Isolation systems offer the ultimate in quiet and smooth operation. Ideal for homes with a living space above or next to the garage. Energy-Efficient. Operation consumes up to 75% less power in standby mode. Electronic Security. PosiLock® system electronically secures a closed garage door and monitors against a forced opening. If a forced opening is detected, it automatically reactivates the opener to the closed position. Safety Sensors. Protector System® safety sensors keep you and your family safe by projecting an invisible light beam across the garage door opening; automatically reversing the door if anything interrupts the beam. Warning System. Alert-2-Close provides UL-compliant audible and visual warnings that the garage door is about to close when using MyQ® technology.